Create a mandala and use it as a spiritual tool by first learning about mandalas. There are many types of mandalas you can create. 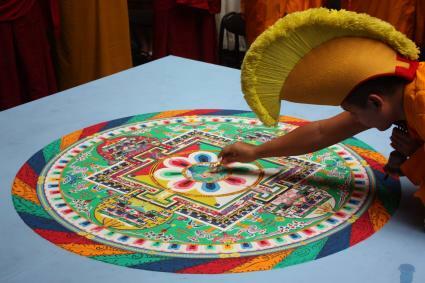 If you wish to create a sand mandala similar to the one Tibetan monks make, you can do so with a few materials. 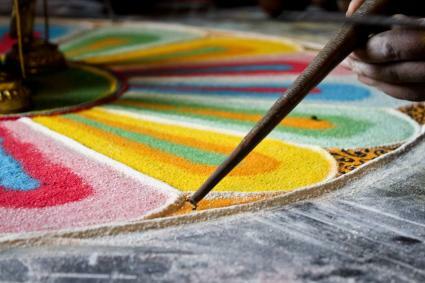 While the mandalas the monks design are temporary, you can preserve your creation and later display. Use the ruler or another straight edge to draw a line between opposite corners and repeat. Where the two lines intersect is the center of your paper or canvas. Place the compass needle on the center (crossed lines) and draw a circle the size you want with the pencil end. Trace various geometrical shapes to complete your design. If you want to add circles or half circles, you can use the compass for smaller-sized circles. Use the tube of glue and trace one pattern with a bead of glue. Method one for applying sand: You can cover the glued area with the appropriate sand color. Let design rest then hold board over a large sheet of paper and allow excess sand to fall onto it. Crease paper in half and pour sand from one end of crease back into the bag or another container for reuse. Method two for applying sand: You can use a chakpur tool (hollow cylindrical tube with wide angled end) for pouring sand. The tube narrows to a small point. Fill the tube with colored sand and position over glue area. Lightly tap cylinder to release sand on top of the glue outline. If you choose to use a drinking straw, take a 1" strip of tape and cover one half of the open end, leaving a slight opening to guide the sand. Choose method one or method two and repeat as you complete your mandala. Set mandala where it won't be disturbed for at least 24 hours, allowing the glue to set and harden. Once the glue is dry seal with a spray on craft sealer. Follow manufacturer's instructions and drying time. You can place your finished mandala on your fireplace mantel, shelf or attach a hanging kit and display on a wall. Another great way to create a feng shui mandala is to draw it. You can create a drawing that can be used in your home decor. Drawing a mandala is less involved than a sand one. You have many options for your choice of medium. Use the ruler or another straight edge to draw a line between opposite corners and repeat. The two intersecting lines indicate the center of your paper or board/canvas. Place the compass needle at this center point. Using the pencil end of the compass, draw a circle the size you need for the main mandala shape. Trace your stencil or the stencils of various geometrical shapes of your design. Use the compass for circle shapes if needed. Using the medium of your choice, begin to color your mandala. Continue to work methodically by coloring in all shapes of the same color before moving on to the next color. If you chose a paint medium, you'll need to set your mandala where it won't be disturbed until the paint has dried. Once your mandala is finished, you can spray it with an appropriate craft sealer. Follow manufacturer's instructions and drying time. You can frame or if using a canvas or art board, hang your mandala in a specific feng shui sector you wish to energize, such as the southeast wealth sector or east health sector. The first thing to decide is which medium you wish to use in order to create your mandala. You may want to use colored pencils, paints or markers. 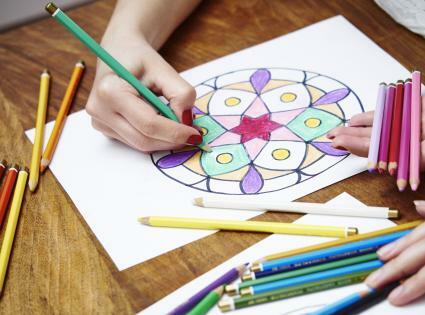 For your first mandala, you may choose a large piece of drawing paper and a pencil. You'll soon begin drawing within the circle. Give over to your inner self and draw whatever and however, it guides you, to create inside the circle. You may want to know how to use your mandala before creating it. Intention and purpose play a key role in the creation of this special meditation tool. The word, mandala, comes from the Hindu language and means circle. Creating a mandala is a reverent act of deliberate conscious thought and desire to reconnect with your unconscious mind. Although the methods and mediums used to create mandalas vary throughout cultures, the purpose is the same. A spiritual student creates a mandala as part of a lesson in learning to focus her or his attention to a single a task. This lesson prepares the student for meditation. Designing a mandala also allows the person making it to create what's called a sacred space. This makes the mandala, whether temporary like the Tibetan sand one or a permanent mandala, a valuable tool for meditation practices. The symbols used within the mandala design are believed to aid you in journeying to the deepest regions of your unconscious mind or higher self. Many people believe this inner world is where your spirit or soul resides. For some, the mandala becomes a doorway into the cosmic realm of spirit. 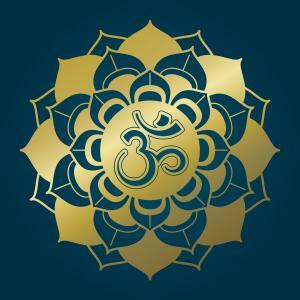 If you meditate by using a mandala, you can unlock universal truths, which in turn give you a greater personal understanding of yourself and your role in life. You'll become aware of how everything in life is connected and dependent upon each other. 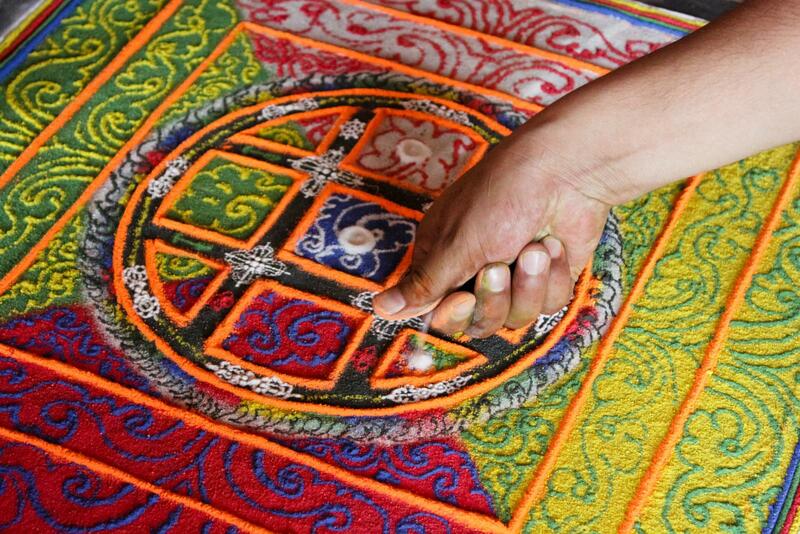 The Tibetans create mandalas from colored sand and use it, in part, to express how temporary life is. Once the mandala is completed, the creators sweep it away because the completion signifies the end of the lesson or purpose of the expression. They then deposit the sand into running water, such as a stream, creek or river. The water then carries the mandala's blessings into the world. If you choose to create this kind of mandala, then you'll fill the inner circle with various Buddhist symbols and glyphs. Many times, people place deity images inside the inner circle to signify the various stages of self-realization and the discovery of universal truths. 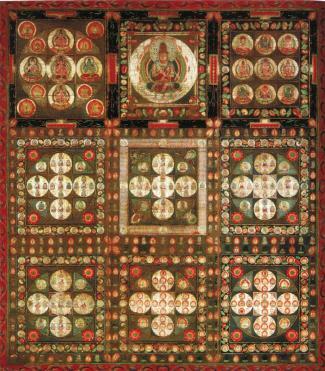 You may choose to recreate the famous Japanese mandala, the Five Buddhas, for your project. 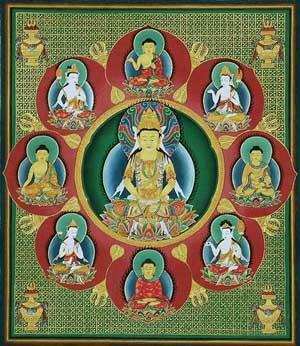 The Five Buddhas represent Buddha's five enlightenments or wisdoms. Historical mandalas depict what's known as the Five Wisdom Kings Mandala (Womb Realm) that are often used with the Five Buddhas Mandala(Diamond Realm). This combination demonstrates how the Two Realms are connected. A mandala conveys a sense of how small you are in a much larger universe. Yet, it also reveals how significant you are, just as each grain of sand is needed to create the mandala. If creating a traditional mandala, you'll want to fill your circles with traditional geometric shapes and patterns to symbolize the cosmos. Bell: The bell represents the female half of the Tantric polarity. The empty bell shape becomes a font for wisdom. Dharma Wheel: The Eightfold Path is symbolized by the eight wheel spokes. This path leads to perfection. Diamond: The hardest known mineral. The diamond's properties of clarity and refracting light in shards of colors represent your mind's ability to focus with this kind of clarity while being able to understand and reflect all things (colors) into the world. Lotus: The lotus symbolizes the great teacher that Buddha became. Like the lotus, your feet (roots) become firmly planted into the earth, yet your spirit (lotus blossom) stretches to the heavens for enlightenment (sunlight). Vajra: This is a thunderbolt and a diamond. It's a weapon but also used in rituals as a symbol of force and indestructible, respectively. The male counterpart of Tantric polarity. This half symbolizes the ability to affect change through the wisdom gained by the bell. You can use a traditional mandala pattern to create your mandala or you can create a unique personal mandala. Explore your creativity with this great feng shui tool. There are many ways you can preserve your creation. You can frame it, laminate it or affix it to an object. You'll want to use it as your focal point when meditating. This mandala is a representation of your inner world and will be an aid to help you delve deeper into that world.